Do your blocks not come out the right size or not all the same size? The problem is most likely your seam. Quilts are traditionally sewn with 1/4", quarter inch, seam. If your seam is not accurate then your blocks will not be accurate either. It's pretty easy to get a perfect quarter inch seam. 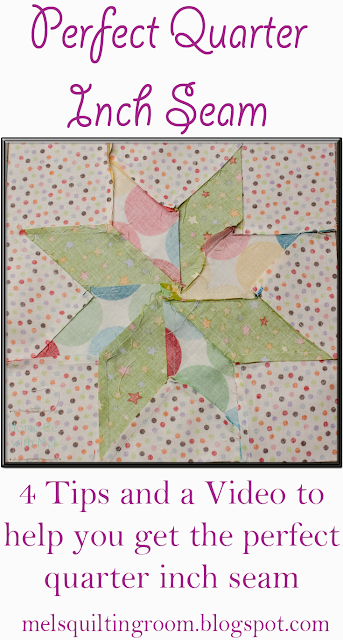 I have 4 tips and a video to help you get that perfect quarter inch seam in your quilting. It will take a lot of practice at first but it's worth it. It's easier in the long run to fix your seams than it is to try to work in a bunch of blocks of different sizes. Some patterns do not lend themselves to squaring up at the end, you have to have a good seam. This post may contain affiliate links. Purchasing from my links costs you nothing and adds a few pennies to the fabric budget. What's the easiest way to get the perfect quarter inch seam? 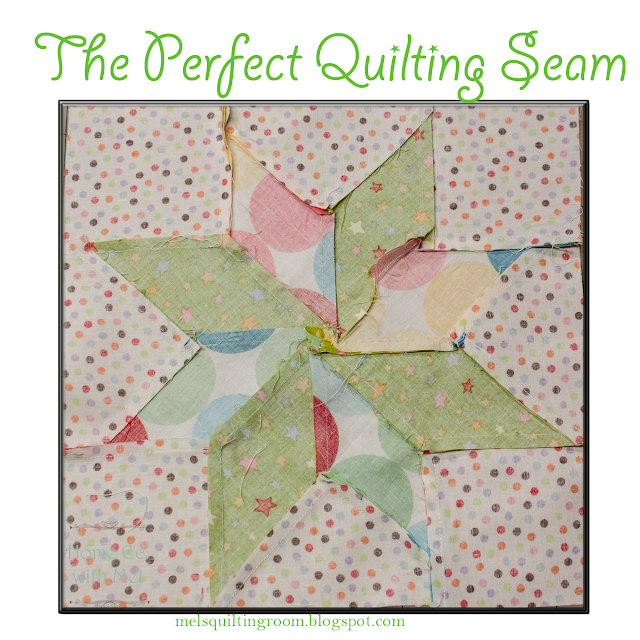 The easiest way to get the perfect quarter inch seam is to use a quarter inch foot. There are several on the market. As you can see the first one has a small blade that comes out. The blade is used to keep your fabric in line. The other two don't have that so you have to guide your fabric yourself. What if they don't make a foot for my machine? I know not everyone can buy one of the feet I have above. My machine is a high shank machine and those feet can be a little more difficult to find. I couldn't find one high shank quarter inch foot on Amazon. If that's the case you need to measure from your needle over to find where your quarter inch is. I'll show you how to do that in the video below. I am extremely lucky that the all purpose foot is a quarter inch foot. My machine came with a seam guide attachment can I just use that? Yes you can! The screw in kind has some drawbacks though. Over time the threads where you screw goes will start to wear down and it won't stay tight. The guides tend to need to be removed or moved a lot. Every time you twist that knob the threads wear down a little. I don't think they were designed with quilters in mind. They don't work if you aren't sewing along the edge of the fabric. If you are doing have square triangles where you need to sew a quarter of an inch away from the line it's not going to work. There are magnetic ones available. I haven't used one. You have to have a machine with a metal bed, also check with your manufacturer if you have a computerized machine before using one. 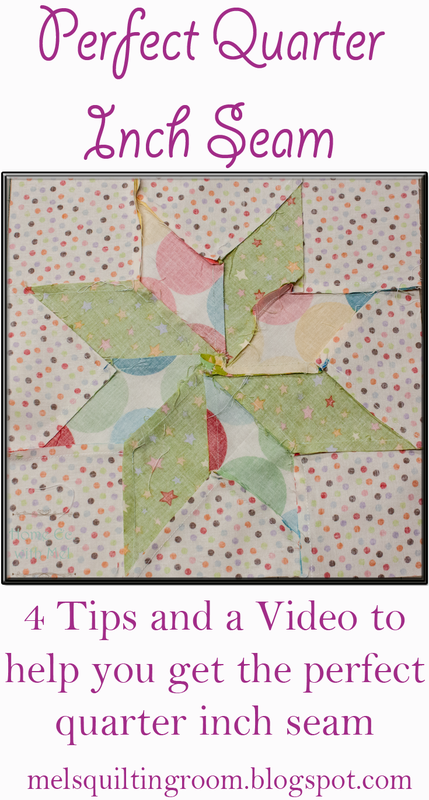 I think every quilt blogger out there has their prefered method so there are a lot of ideas. I personally like painters tape. It doesn't leave residue behind. It can be repositioned without damage. I can draw lines on it if I need a scant quarter. You could also use washi tape which I have done. Since washi tape comes in tons of patterns you can give your machine a little personality. In the video below I show you how to easily measure a quarter of an inch from your needle. So now you are ready to head out and sew! Remember to keep your seam ripper handy, it may take a while to get the hang of it. Just don't give up!! We all have been there, trust me. Thanks so much for sharing at Merry Monday!